Seattle has a higher percentage of new-construction apartments in its housing stock than any other big U.S. city. That can make it pricey for newcomers to move here. Just how big is Seattle’s apartment boom? Maybe even bigger than you thought. As of 2016, there were nearly 21,000 occupied rental units in the city built since the start of the decade, according to new census data. That means recently constructed apartments make up 12 percent of the total rental stock, or one out of eight units. 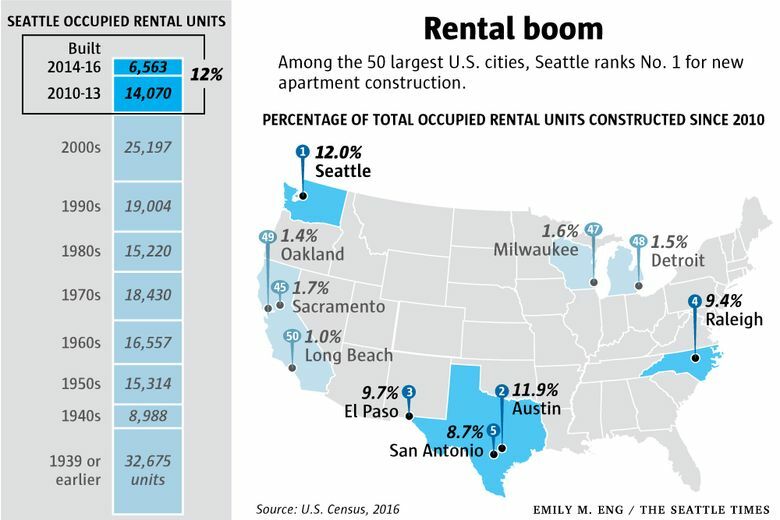 Among the 50 largest U.S. cities, that ranks Seattle as having the highest concentration of newer apartments. Only Austin, Texas — the nation’s other fastest-growing city — is comparable to Seattle, and the two stand apart from the rest of the pack. In no other big city does newer construction make up even 10 percent of the total rental stock. In Long Beach, California, a mere 1 percent of units have been built since 2010.
Who lives in all these new Seattle apartments? Predominantly, millennials — many of the young people pouring into town wind up renting out these units. The census data show that 65 percent of apartment units constructed this decade have a resident under the age of 35. 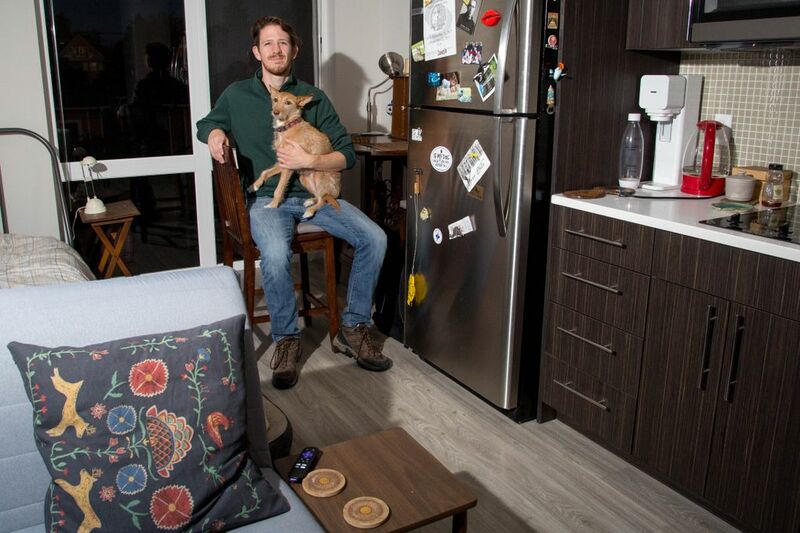 In comparison, 52 percent of Portland’s newer units have a millennial resident. In San Francisco, it’s just 39 percent. The 27-year-old relocated here this summer from Athens, Georgia, to do postdoctoral research at the University of Washington. He expected to find the type of apartment he’s lived in before: older, cheaper and a bit funky. He tried to find the something older with a more budget-friendly per-square-foot price, but it proved difficult for someone moving here from across the country, and apartment hunting online. Also, there was more competition for the older, more affordable units. At a couple of apartments Groom had scheduled to see, his appointment was canceled because someone else had just signed the lease. And many of the older properties weren’t pet-friendly, and Groom was moving here with his dog, Dizzy. His phone calls about other older properties were never returned. In the end, leasing in a new property was easier for Groom, and probably for many other young people who are facing the complicated logistics of a cross-country move. The convenience comes at a cost, though. 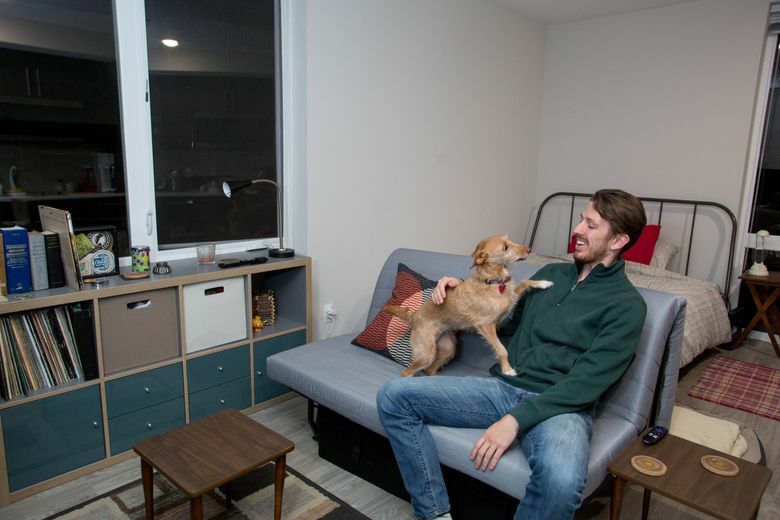 Groom is paying a budget-stretching $1,425 per month — and the only reason the unit is that “affordable” is because it’s so tiny, at just 345 square feet. Groom says he’d never paid that much before, or lived in such tight quarters. The high cost of housing hasn’t yet hindered growth in Seattle and some other job magnets, but that may start to change, says Jonathan Spader, a senior research associate at Harvard University’s Joint Center for Housing Studies. Spader says that economists are increasingly paying attention to the tendency for jobs and talented labor to “co-locate.” In other words, companies take into consideration where workers want to live when making decisions about where to locate. Despite the high cost of housing in Seattle, Groom says he’s thrilled to be here. And his new apartment suits his needs. The Capitol Hill location is great, and light rail to the UW is within walking distance. According to new data from real-estate analytics firm Real Page, Inc., the Seattle metro area had a 4.3 percent rent growth for new residents in the third quarter of 2017. That ties as the seventh-highest in the nation.